The primary function of Jones Barrel Company is to recondition R.C.R.A. empty containers. As a result, we are constantly searching for new resources. Initial contact with Jones Barrel Company will include our taking the time to review the various government rules and regulations associated with empty containers. We will also try to determine at this time, what type of container you have available, and the products these containers previously held. Decisions on the acceptance or rejection of drums are according to the following guidelines. This is for our customer’s protection, as well as protecting our employees, and our environment. The following rules and guidelines established by the United States: Occupational Safety & Health Association (O.S.H.A. ), the Department of Transportation (D.O.T. ), and the Environmental Protection Agency (E.P.A. ), will be strictly enforced and followed in recycling your empty containers. O.S.H.A. – O.S.H.A.’s hazardous communication standard (CFR 1910.1200) requires that we receive from our customer’s the S.D.S. on the previous product in the container, before we accept any drums. This allows us to review the S.D.S. to insure all safe handling procedures are followed. Once received, your S.D.S. are kept on file in our office. We will require new S.D.S. be sent as you receive updates, or if you have a change in product. All bungs must be reinserted into the drum and covers must be refastened with their locking ring. Labels should be left intact on the empty container to insure any personnel handling the container follow all safety precautions. Only if the containers have been cleaned and purged at your plant, should the labels be removed. Under D.O.T regulation 49 CFR 173.29. When shipping R.C.R.A. empty drums, prepared for shipping as above, vehicles transporting these containers are exempt from D.O.T placarding and shipping paper requirements. No more than 3 percent by weight of the total capacity of the container remains in the container or inner liner if the container is greater than 110 gallons in size. It was noted on the R.I.P.A. website that in the August 18, 1982 Federal Register, E.P.A. clarified that emptiers must read paragraphs 261.7(B)(1)(I) and 261.7(B)(1)(II). The paragraphs require that the container be emptied of all materials that can be removed by practices commonly employed, e.g., pouring, and only after employing those methods, can the container contain no more than one inch. The one-inch provision provides an allowance for extremely viscous materials, for example, tars, not flowable materials that can be removed by common means. 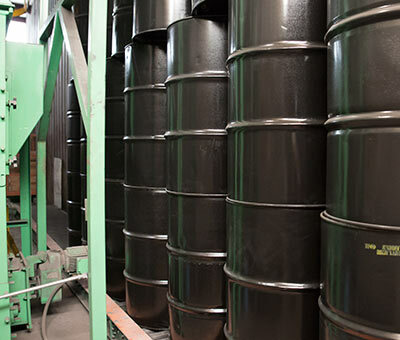 When empty containers arrive at our plant, we will visually inspect the incoming drums. At this time we will be inspecting drums to determine if in fact they are empty according to R.C.R.A standards. Containers that are not empty according to these standards will not be unloaded. These drums will be rejected. They will be marked as not empty, left on the truck, and returned to the sender freight collect. Containers that are accepted will be graded as to the product of construction, the U.N. specifications, the degree of damage, and the possible reuse of the container. Whether your drums are accepted by Jones Barrel Company for recycling or disposal, we can guarantee the de-identification of your company’s R.C.R.A. empty containers. We will work with you to develop a partnership to insure proper handling of your empty containers.